Véronique Enginger There are 72 products. 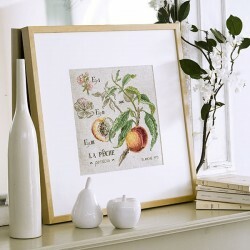 To embroider in cross stitch on a lovely, beautifully coloured Aïda fabric of excellent quality, the Peach Study is part of the Botanical Studies collection by Véronique Enginger for Les Brodeuses Parisiennes. The finishing touch: the « dragonfly » charm in metal. To embroider in cross stitch on a lovely, beautifully coloured linen fabric of excellent quality, the Peach Study is part of the Botanical Studies collection by Véronique Enginger for Les Brodeuses Parisiennes. The finishing touch: the « dragonfly » charm in metal. 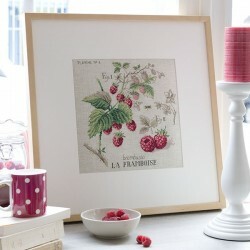 Embroidered in cross stitch on a lovely high quality linen fabric in a difficult to find colour, this Rapsberry Study is part of a series of botanical fruit studies. An appealing detail – the gold metal dragonfly charm. 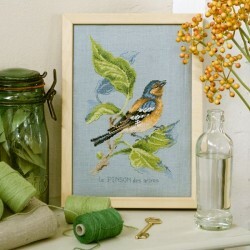 To embroider in cross stitch on a lovely, beautifully coloured linen fabric of excellent quality, the Robin Study is part of the Bird Portraits collection by Véronique Enginger for Les Brodeuses Parisiennes. Embroidered in cross stitch on a lovely high quality linen fabric in a difficult to find colour, this Apple Study is part of a series of botanical fruit studies. An appealing detail – the metal dragonfly charm. 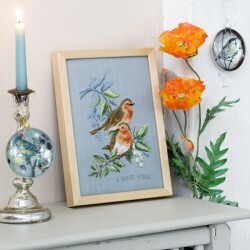 Embroidered in cross stitch on a lovely high quality linen fabric in a difficult to find colour, this Waxwing Study is part of a series bird portraits. 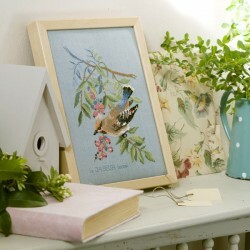 Embroidered in cross stitch on a lovely high quality linen fabric in a difficult to find colour, this Finch Study is part of a series bird portraits. 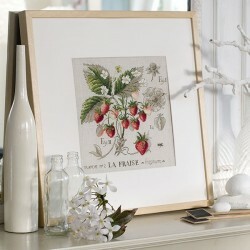 Embroidered in cross stitch on a lovely high quality linen fabric in a difficult to find colour, this Strawberry Study is part of a series of botanical fruit studies. An appealing detail – the gold metal dragonfly charm. 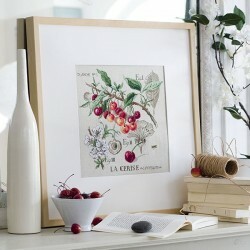 Embroidered in cross stitch on a lovely high quality linen fabric in a difficult to find colour, this Cherry Study is part of a series of botanical fruit studies. An appealing detail – metal dragonfly charm.